Please remember that the committee has decided that all players must have paid their membership fees for 2014 before being eligible for selection this season. Membership remains frozen for the fourth season in a row at £40 for adults. Please make payment to a member of the committee at training or by post. Interesting Cup Draws made today at Camanachd Association HQ in Inverness. We have been drawn away in the Aberdein Considine Sir William Sutherland Cup to Lovat. We have never played the Kiltarlity side but they will be a formidable set of opponents, finishing high regularly in North Division Two and having won this trophy in 2010, after a losing final appearance in 2009. We look forward to what will be an interesting trip to Balgate. We will face North Division Three rivals, Strathspey, at home, in the first round of the Strathdearn Cup, with the reward a quarter-final with the winners of Lochbroom V Strathspey. All four clubs will be looking at this draw with anticipation as it provides a rare opportunity to make the semi-final stage. Games with Strathspey have been entertaining over the last few years, so another cracker will be in prospect. The Cuach a’ Chuain Sgith has been confirmed for February 22nd in Ullapool v Lochbroom. League Format still to be decided. We have a little bit of news regarding the new season that awaits us in 2014. We will of course still be playing in North Division 3. This will be a six team league consisting of Kilmallie, Caberfeidh, Strathspey, Inverness and Lochbroom, as well as ourselves. Fixtures will not be known until early February. This is obviously a smaller league than in previous years but we should make up for any fixture shortfall with our re-entry into cup competition. We have not competed in the cups since entering the league in 2011. As our last cup game was a misfortunate to say the least 18-0 defeat to Skye in 2010, we can only say that things should hopefully be better this time! We will be entering the Strathdearn (North Reserve Cup) and Sutherland (National Reserve Cup) once again. The cup draws for all the cup competitions will be drawn this Tuesday 28th January at 1.30pm in Alton House, Inverness. Stay up to date on the Twitter and Facebook accounts as our very own man at the Beeb, Donald Lamont will be present. News on preseason friendlies to come. Training continues in earnest. DUBH IS GORM! There will be a committee meeting on Wednesday 22nd January at 7pm in Stornoway Primary as there is a lot of business to discuss with the season about to start. This meeting will run to a tight schedule 7-8pm & then coaches,management & vice-captain will meet for discussion regarding training & preparation. Points for agenda to Andrew MacAskill please. There is also another Positive Coaching Scotland workshop taking place on Monday 27th January 2014 in committee room 2 in the council offices starting at 6pm. If you wish to book a place please ask Diablo for a booking form and return it to the Lewis Sports Centre. Training continues unabated in preparation for season 2014. At present we still only have Lochcarron lined up for the home friendly on February 15th. There is no word at all from Lochbroom regards the Minch Cup but Conor is beavering away trying to secure at least one more fixture to aid our buildup to the new year. Youth training is on at 10am at the Sport Centre in Stornoway. Outdoor training is on at 12noon-2pm at Stornoway Primary School, weather permitting. Circuits continue Thursday at 7pm. Membership is due – it has been frozen again at £40 for this year – players will not be eligible for selection this season until they have paid. New players always welcome, whether they have previous experience or not. A great day at Bayhead for the Iomain Challainn with a great turnout in difficult conditions. The teams were picked in the old Stornoway Club tradition by the Captain, Duncan, and the Vice Captain, Paul. After a first half which yielded only one goal to the Captain’s Greens, from the caman of Ally Lamont, the second half saw a flood almost as dramatic as that on South Beach the other day. Graham Cay(2) and guest player Gibbs Macdonald scored for the Reds but Duncan and Will picked up where they left off last year, Will grabbed a brace and Duncan banged in a mighty four goals in the space of twelve minutes to ensure his team picked up the honours with a 7-3 win. A warm welcome to Gibbs as well, who will be working in Stornoway for a wee while, we hope he’ll make it along to training, and also to Angus Murray, who has moved to the island and has experience of playing Uni Shinty with Strathclyde. A great day for all involved and here’s to any other successful year for the club. Gle mhath were the boys! A big thanks to the Stornoway Golf Club for their cracking hospitality! Come on down to Bayhead this Saturday at 2pm for the annual Iomain Challainn match. Always a great way to start off the year and get a little action in before the pre-season friendlies kick in. This tradition was a feature of island life for centuries, being played as late as the 1920s in Uig. 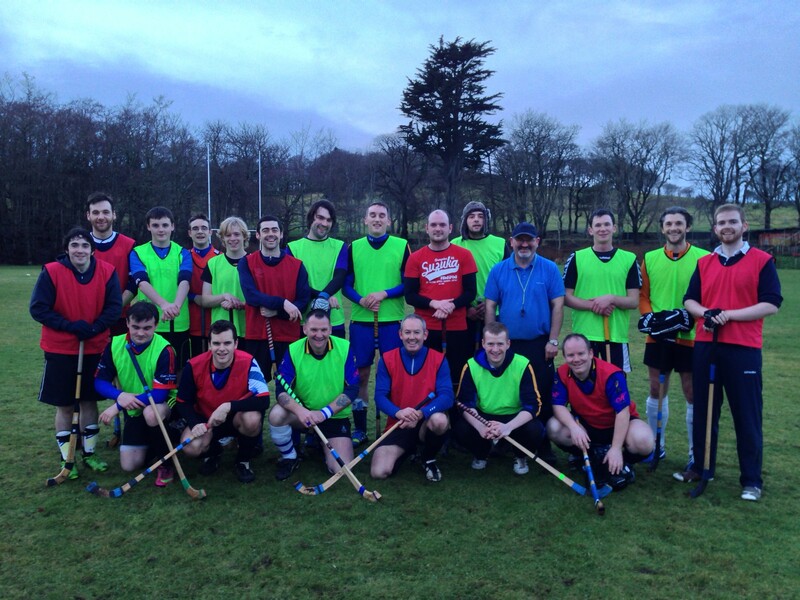 The revival of shinty in the Western Isles in the 1990s stems from the efforts of the late Dr Alasdair Barden to resurrect this tradition at New Year and the club has been continuing this tradition in the modern era. If as many volunteers as possible could be down at Bayhead for 1.30pm to help set up. All Senior and Junior players who can make it should head down, and any players from other clubs who are on the island are welcome, especially after Dougie Rankin’s guest appearance last year! If you can play, contact fixtures secretary Conor Macdonald.